14-20 November 2013. 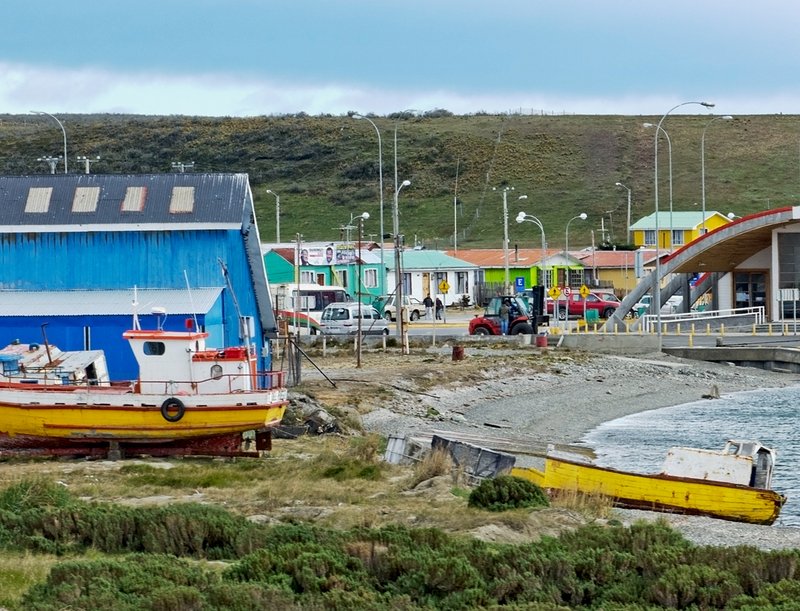 From Puerto Natales we took a bus south to Punta Arenas, the most southerly town on the mainland of South America. From what we’d read it seemed that Punta Arenas is an industrial town and shipping port with not a lot to recommend it, so we allowed only one day there to break the long trip from Puerto Natales to Ushuaia. 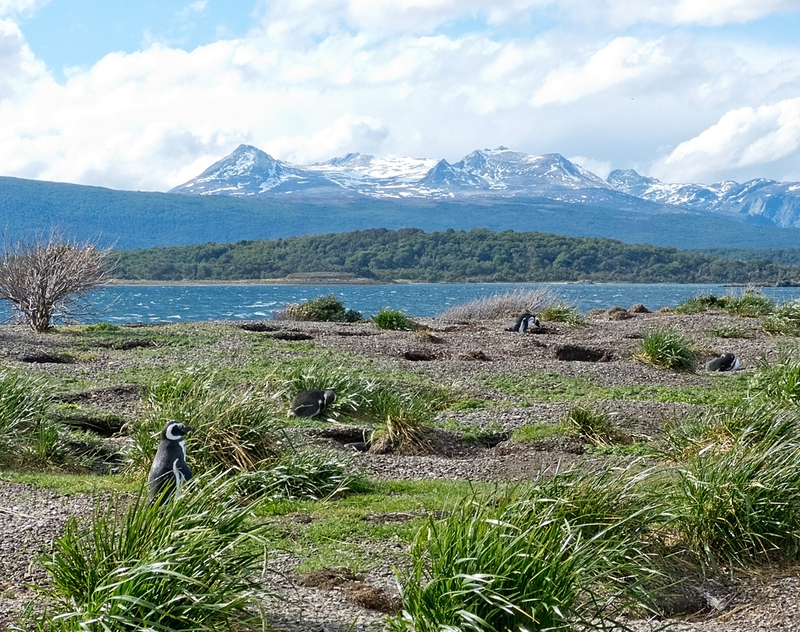 We thought we might do a boat trip to an island where we could see some Magellanic penguins, but also knew we’d be able to see them when we got to Ushuaia. I was surprised to see a huge poster of King penguins behind the reception desk of our hotel. I wondered why it would be there since I understood that King penguins can only be found in the Antarctic. It was totally unexpected. I pointed at it and said ‘I want to see them!’ We had no idea if that was even possible. I was surprised again by the response of the receptionist. She calmly told us where to go to book a tour. 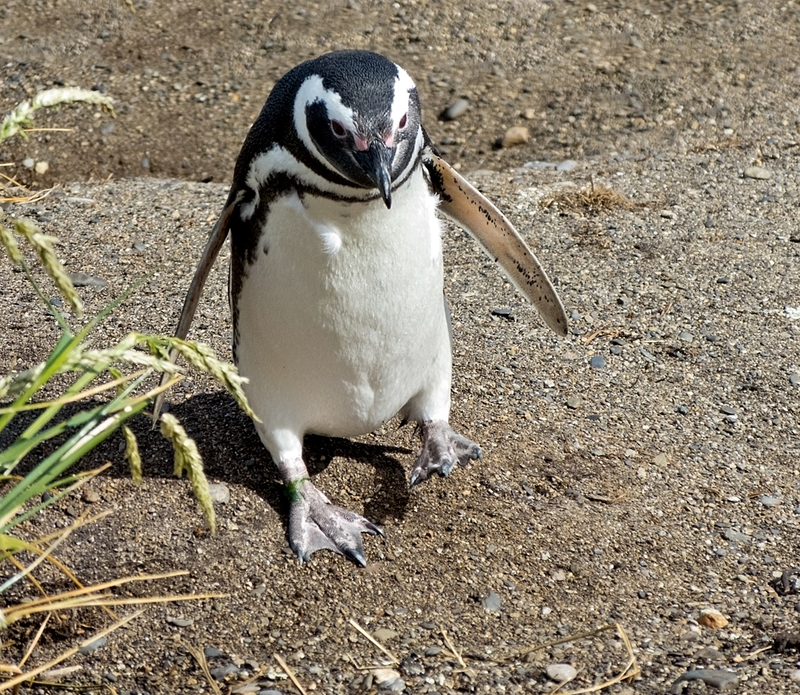 At the same time we booked a half-day trip to see Magellanic penguins for that same afternoon. We barely saw Punta Arenas. I hardly even remember Punta Arenas. 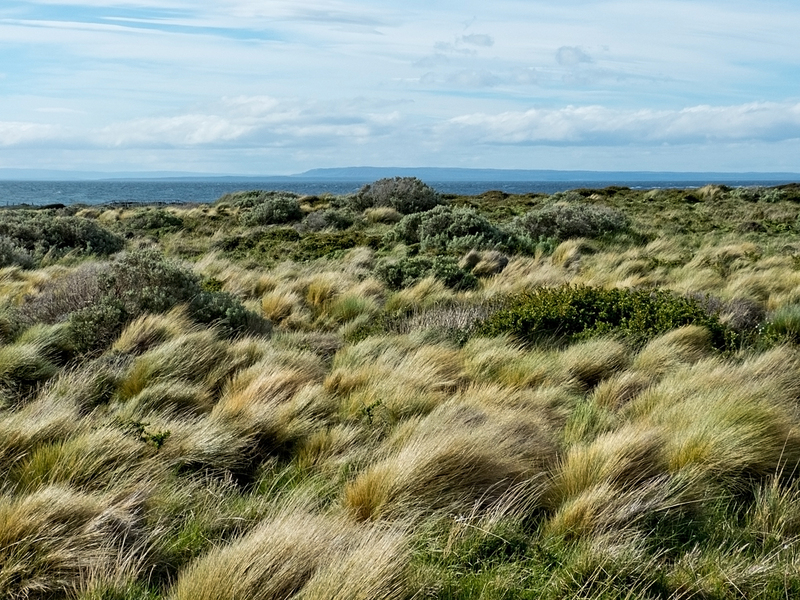 What I remember is a lot of penguins, and long long drives through the empty grasslands of Patagonia. Getting to see King penguins was a completely unexpected opportunity and we were both very excited. Apparently there are only three colonies outside Antarctica: one on the Falkland Islands, one on the State Islands just to the east of Tierra Del Fuego, and the one we visited on the Chilean (western) side of Tierra Del Fuego. Just getting to Tierra Del Fuego felt like a major achievement for me. It is a large island off the south coast of South America, though by no means the only island in the area. I’d done a four-month overland adventure tour of South America in 1978 and we’d all decided we really wanted to get to Tierra Del Fuego – only to be able to say we’d been there. I think. I can’t remember any other reason for the enthusiasm. I do remember I knew nothing about it and just went along with what the group wanted. 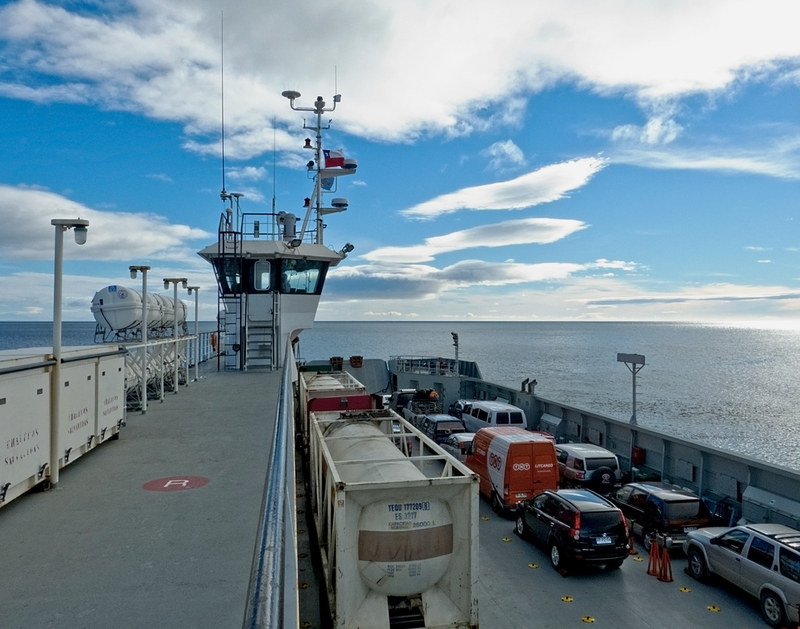 Anyway when we finally got to Punta Arenas the wind was so bad all the ferries were shut down and we never did make it across. My strongest memory is of the effort and hilarity of us all trying to erect our tents in gale-force winds. Back to 2013. Finally on the ferry to Tierra Del Fuego. 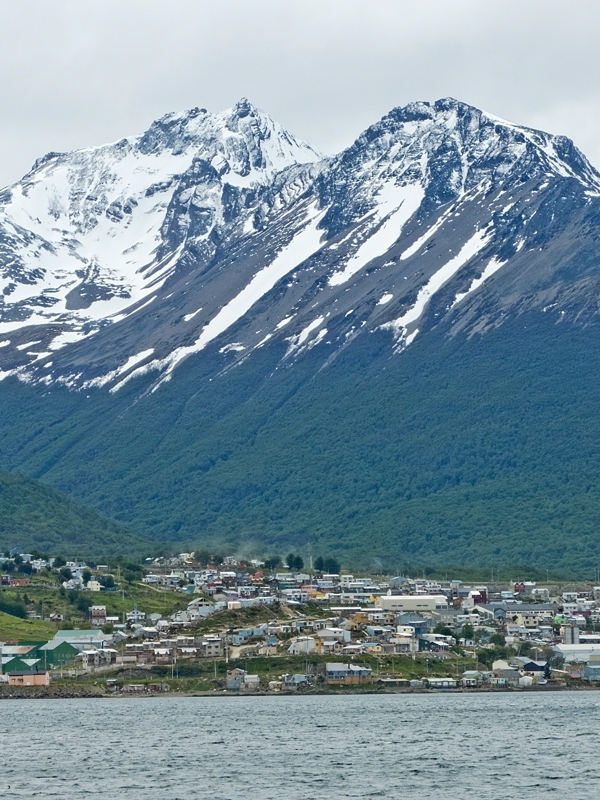 A quick glimpse of Porvenir, the largest town on the Chilean side of Tierra Del Fuego – I wish we’d had time to explore a bit. On the way to the penguins I saw pink flamingos and shouted from the back of the van: stop! Please stop! Please stop! 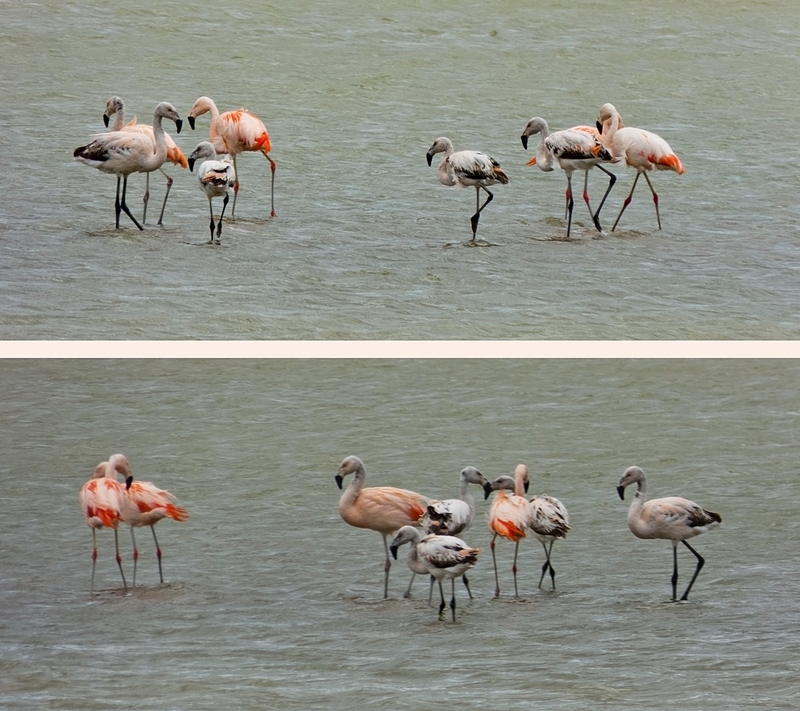 So we stopped and I got my first opportunity to really watch and photograph pink flamingos from a relatively close distance, all the while with the guide calling out ‘lady’, ‘lady’ as if I was going to start abusing them or something, as I stealthily crept closer and closer. When I’d finished and returned to the van he told me that if you get too close to birds they’ll fly away. Really? He was a controlling pain, but I imagine he’s had his share of recalcitrant tourists. The flamingos were fabulous. I was completely captivated. Just look at those bright red tail feathers! 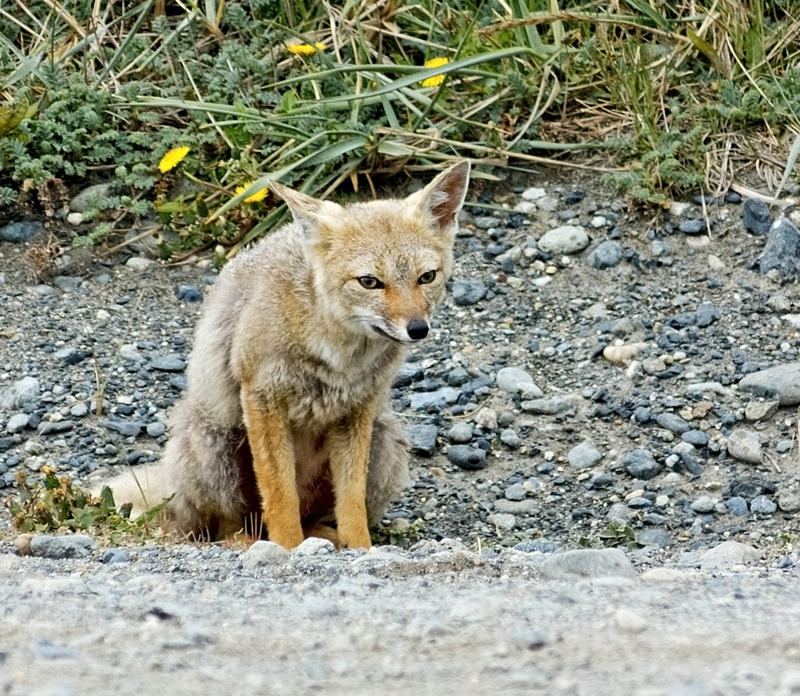 When we got to the entrance to the penguin colony there were a couple of foxes hanging around. They were not tame, but neither were they afraid of us. And then, after walking a short distance across a field there they were! 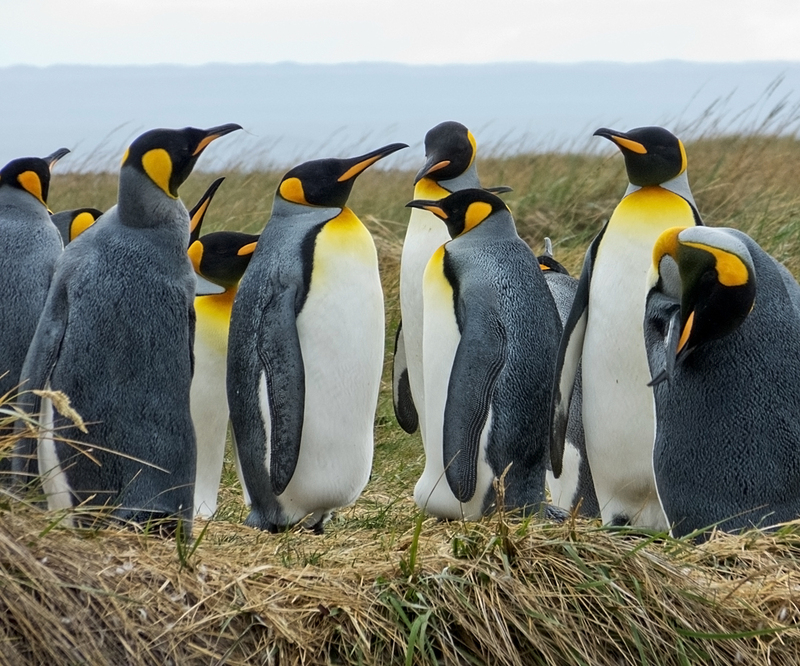 King penguins! Sixty-four of them on that day’s count. We were very lucky to see so many. They come and go about their penguin business. Some days there may be as few as fifteen. This colony suddenly arrived four years ago. Nobody knows why, however it is only a short distance beyond their normal breeding area. For the next hour or so we crawled around on the grass being as inconspicuous and still as possible, getting as close as we could, watching and photographing. They were just across a small river (or inlet from the sea) and we watched them climbing in and out of the water, communicating with each other, and grooming. At one point one of them crossed the water and walked right by us. The one in this next photo with his head high in the air is ‘singing’. Many of them did it, and quite frequently. You know that whirring noise a car makes when you’re trying to start it on a really cold morning, or the battery is dying? Like that only much higher pitched. Truly unique. I’ve never heard anything like it. The entire day, except for a ten minute break to photograph flamingos, consisted of an hour or so driving to the ferry, two hours on the ferry, another two hours driving to the penguins, an hour or so with the penguins, followed by a three hour drive all the way across the almost featureless Chilean half of Tierra Del Fuego, a one hour wait to get on a ferry, a twenty minute ferry ride back to the mainland, and a two hour drive back to Punta Arenas. All that driving for only about an hour with the penguins because of the ferry schedules. It was the only way to do it. Was it worth it? A resounding Yes. Every moment. And every penny. Not only did I make it to Tierra Del Fuego, this time I got there twice. 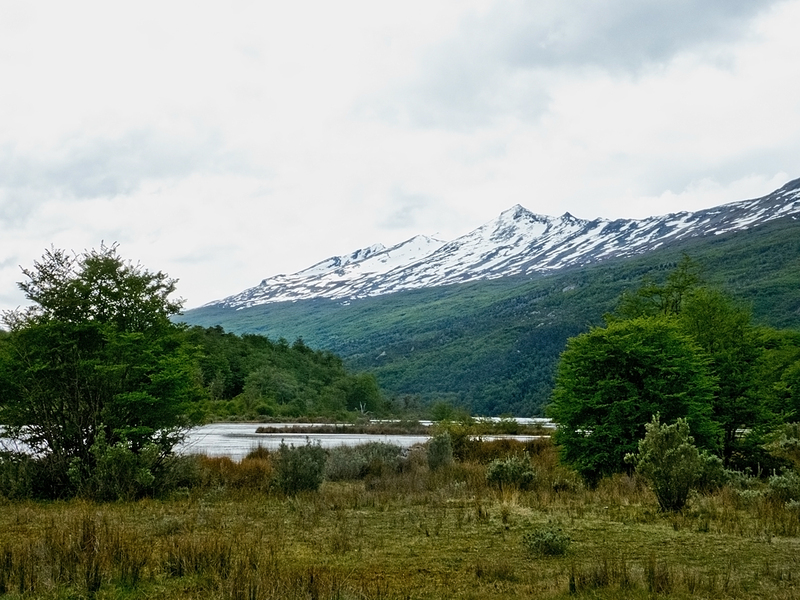 From Punta Arenas we re-entered Argentina travelling by bus to Ushuaia, the most southerly city in the world, situated on the southern coast of Tierra Del Fuego and surrounded by mountains. Dwarfed by mountains. 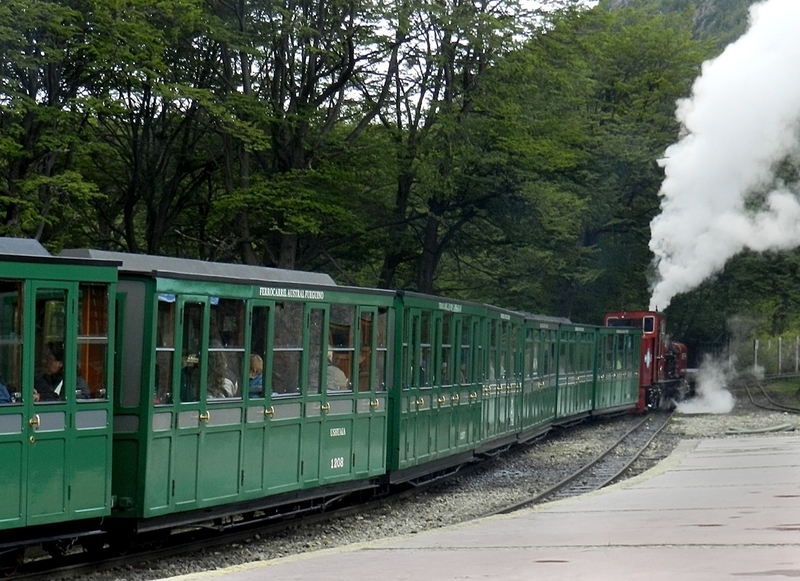 Don’s photo – he loves trains. We spent another day devoted to penguins. This time it was Gentoo penguins, and the more common Magellanic penguins. We were able to walk among them, see them swimming, playing on the beach, and in their nests. They are very social birds, constantly communicating with each other and grooming each other. 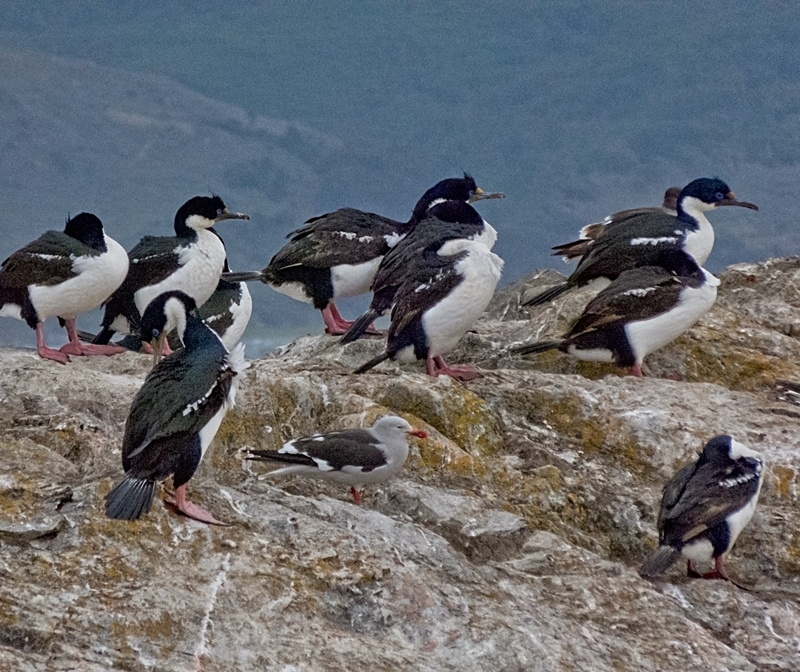 Our guide pointed out young ones that would have been born earlier this year but I could hardly tell the difference. 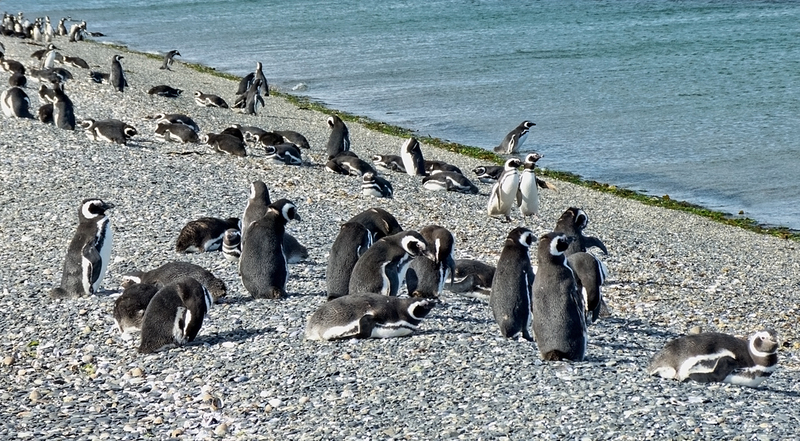 The Magellanic penguins nest in burrows. and here on Magdelena Island near Ushuaia. 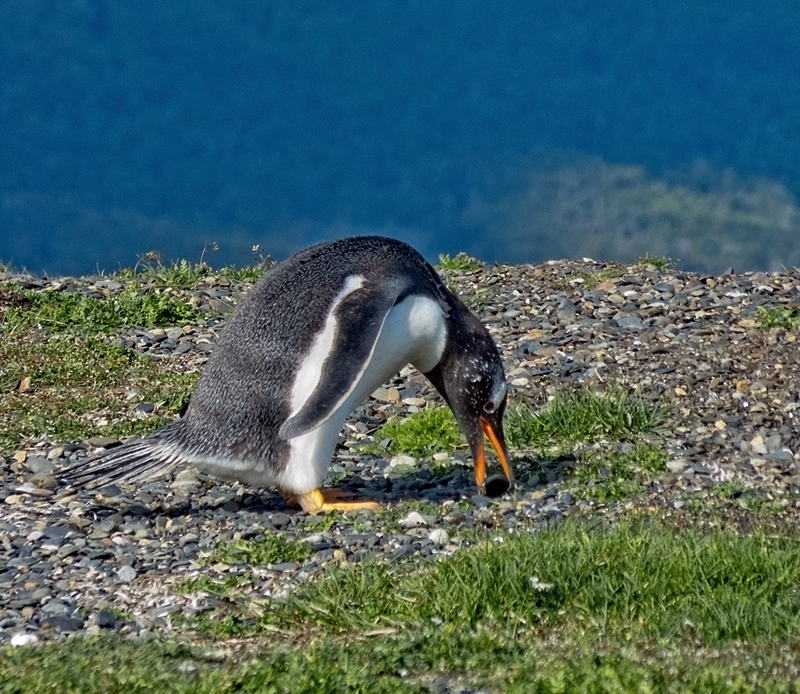 The Gentoo penguins are surprisingly different. They use mounds of pebbles and shells as nests. I watched as one of them walked purposefully to where there were some pebbles, pick one up in his beak, and carry it back to add to the nest. 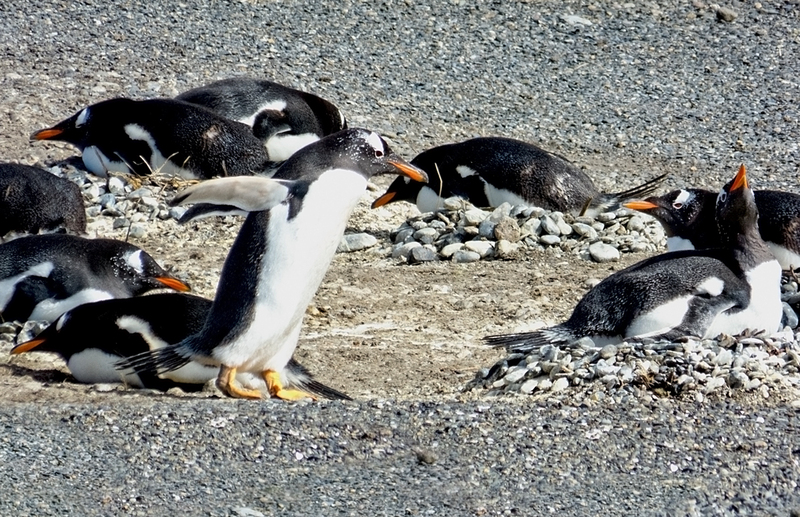 In amongst the Gentoo penguins: an unexpected lone King penguin. Our guide said they roam when parenting duties are over. Our final excursion was a cruise along the Beagle Channel, that narrow strip of water between Tierra Del Fuego and the islands to the south of it. 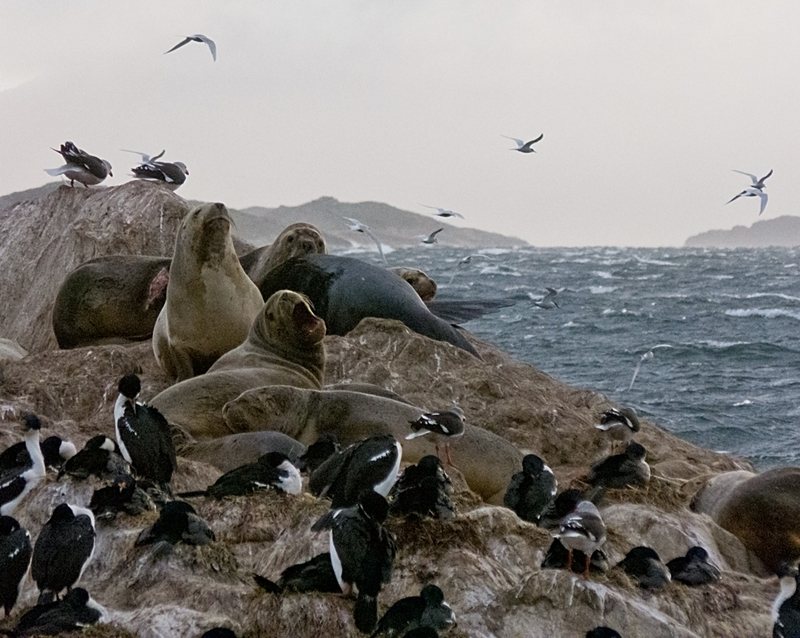 We went slowly along the channel on a grey day, past infrequent lonely farms, the occasional wreck, a lighthouse, more penguins, and small rock islands thick with sea birds and sea lions. Photography was hilarious. The longer we were out the worse the weather got, the wilder the wind got, the rain came, the boat groaned and lurched, the light diminished, the camera shuddered in the shrieking wind, and the lens got covered in sea fret. By the time we landed back in Ushuaia the storm had passed and we were greeted by sunset and partly blue skies. It had snowed there while we were gone. Ushuaia, surrounded by mountains, at the end of the world. Wild unpredictable Patagonia weather. Three seasons in one day. It’s rarely summer. 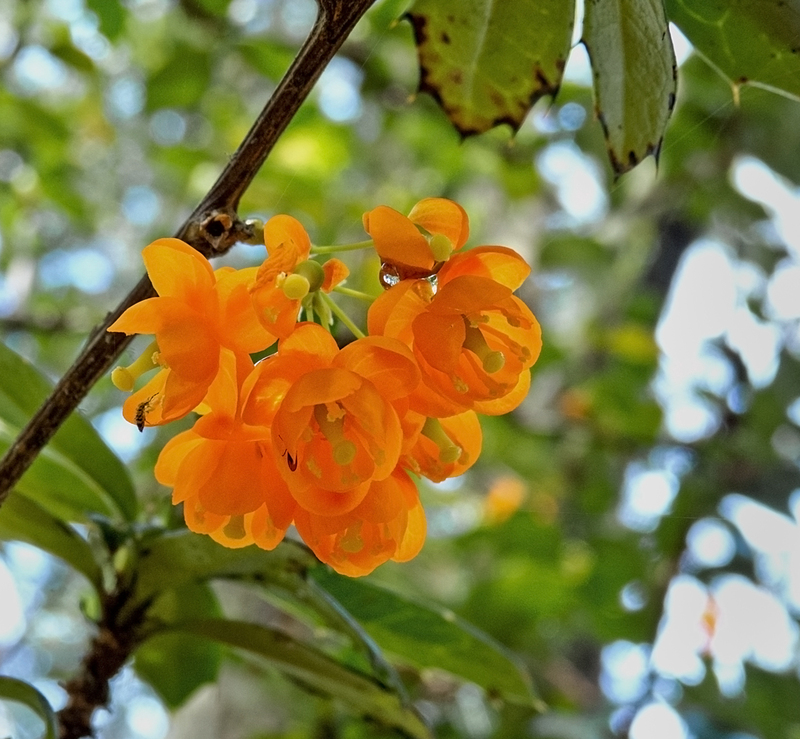 A day here and there maybe, like the day we had in El Chalten and hiked to see Mount Fitz Roy, and the day in Puerto Natales when we went to Torres Del Paine. 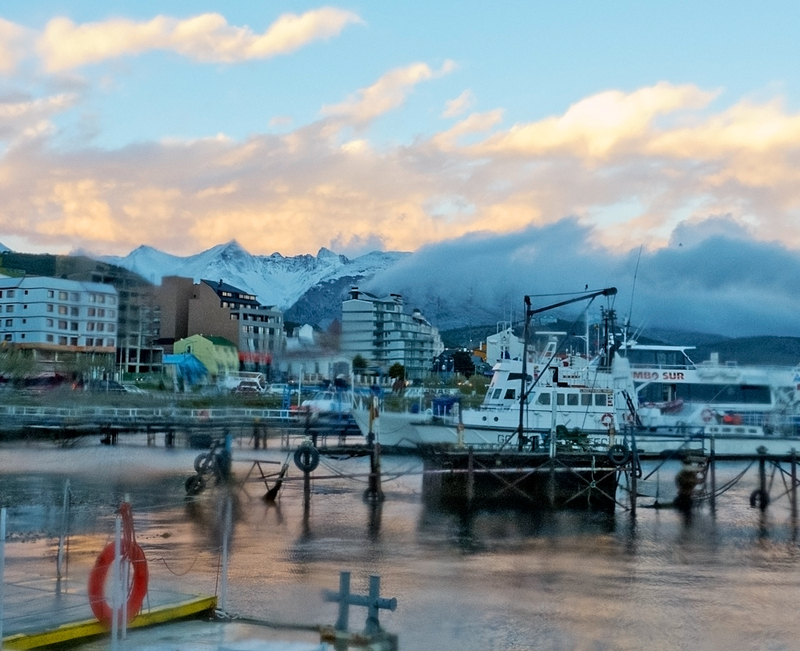 In Ushuaia the average daily low in winter is zero degrees. The average daily high in “summer” is ten (50F). It was snowing again the morning we left. We’d had our fill. We loved every minute of our time in this rare raw wild brazen and beautiful part of the world, but was time to warm our bones. So we flew to Mendoza, where it was over thirty every day, and thawed out. I liked the penguin images most. Thanks Sreejith. Those penguins are just wonderful aren’t they? We loved them. Alison, you have inspired me! Fantastic post and photos. I want to visit Argentina and see the magnificent penguins, thank you. Thanks Patricia. Go to Patagonia – it’s truly fabulous. 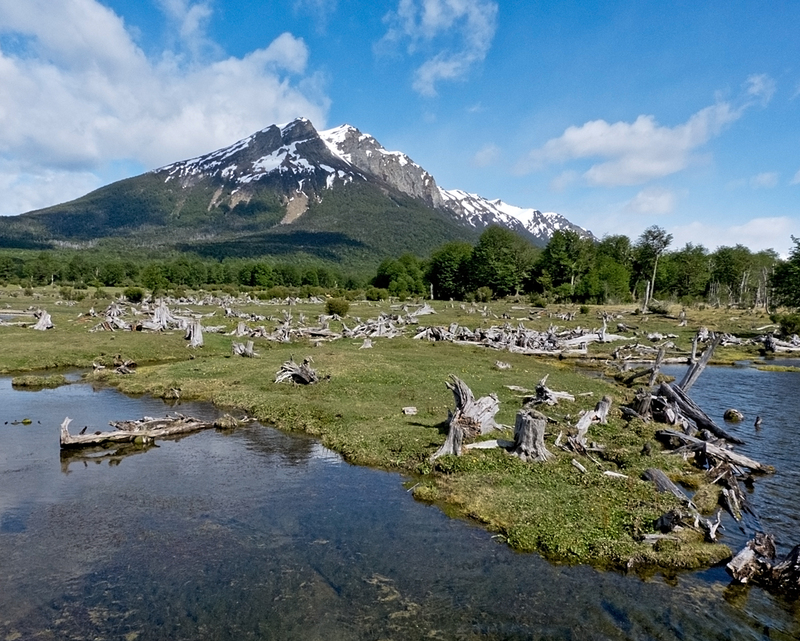 Just the name, “Tierra del Fuego” sounds like an adventure. You took fantastic photos of the flamingoes and penguins. What an amazing place to explore this is. I was not familiar with the gentoo, but have seen the Magellanic at the San Diego zoo. Thanks Frank. Oh it is certainly a most amazing place to explore. I highly recommend it. 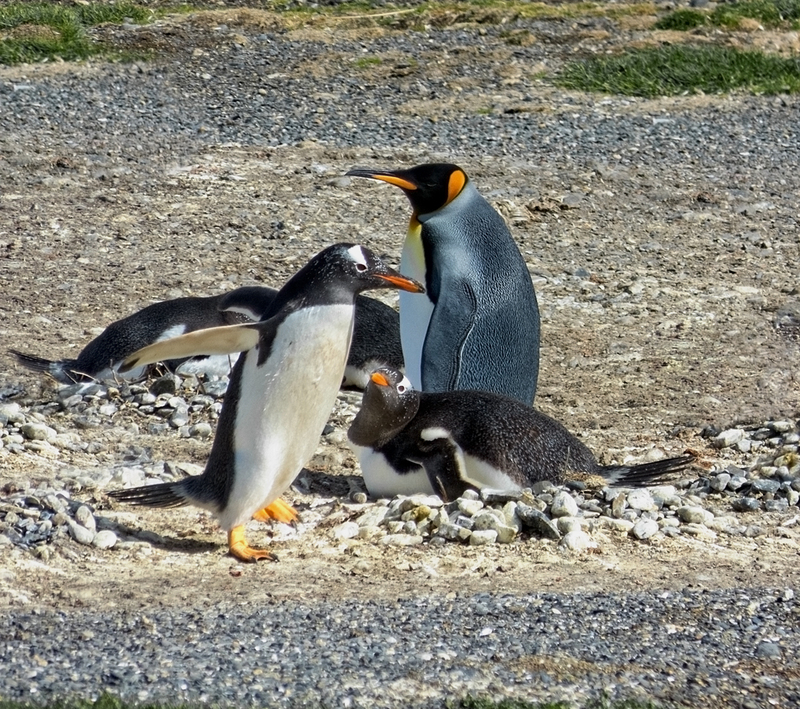 I’d never heard of the Gentoo at all, maybe vaguely of the Magellanic, but I’d definitely heard of, and seen pictures of the King penguins. I’m so glad we got to see them. it was really special. Another set of stunning photographs. 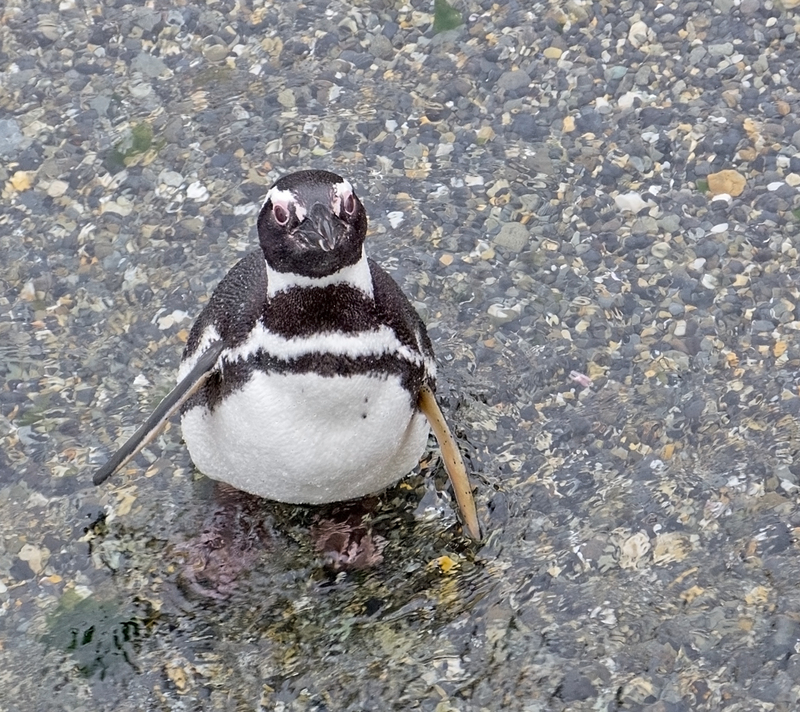 But my favorite is the Magellanic penguin looking right up at the camera. You’re right, you know – cute is the only way to describe them! What great photos. 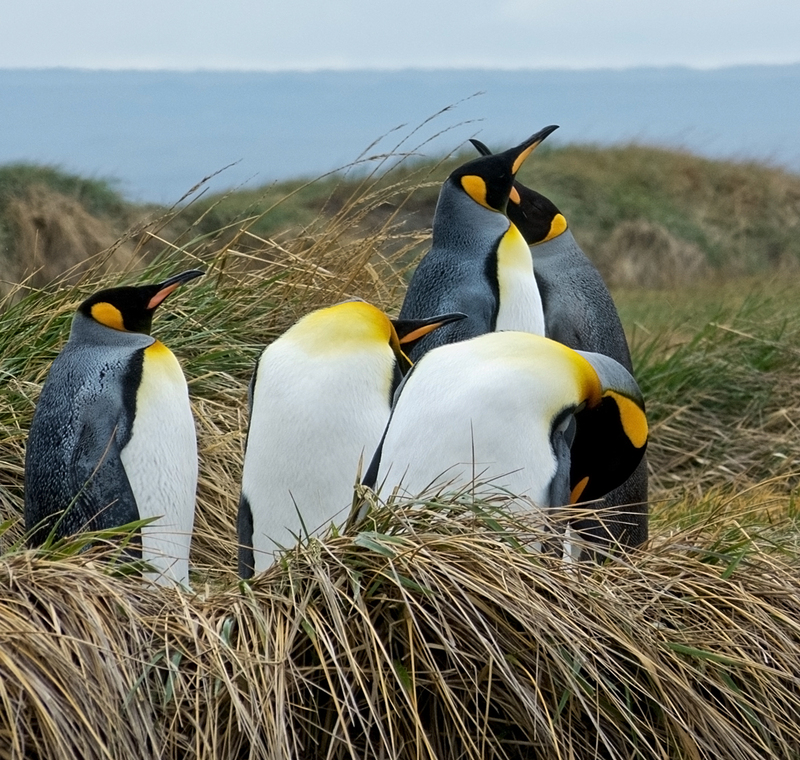 The King penguins are beautiful, I can see how you wanted to be there to photograph them. My favorite of all the photos is the one above the paragraph that starts “By the time we landed back in Ushuaia the storm had passed”…superb! Oh I love it that you chose that particular photo as your favourite. Thanks! I had the shutter speed way up because there was so much movement, which meant I had not much depth of field and low exposure. And the lens was covered in sea fret. I really had no idea what I was getting, just pointing the camera and clicking. The one above I had no idea that that seal had his mouth wide open. It was fun to discover later on the computer what I’d captured. Truthfully most of it was garbage, but I got one or two good ones. 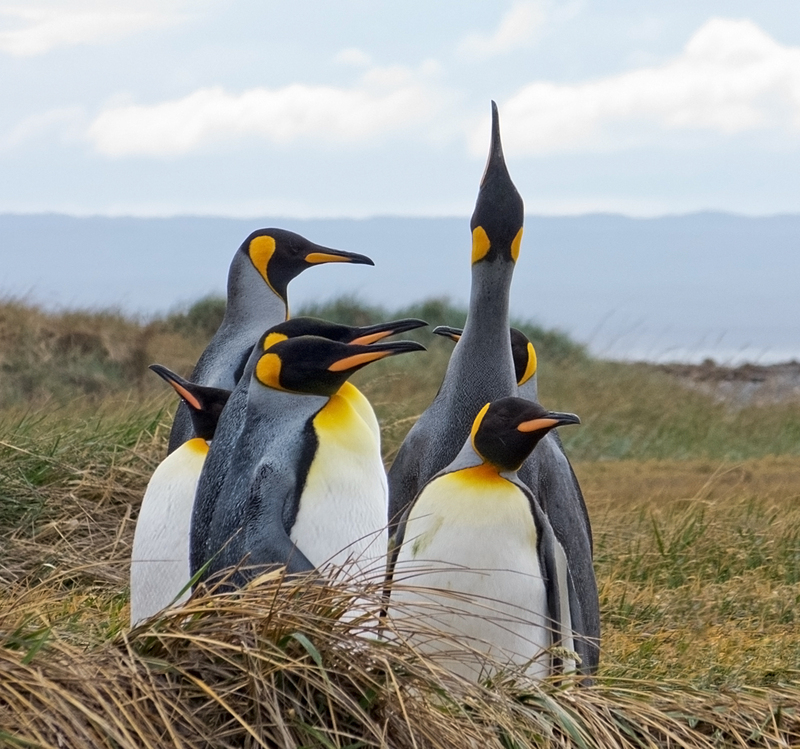 And yes, so exciting to see and photograph the King penguins – so beautiful. I agree, that photo is so beautiful and artistic. 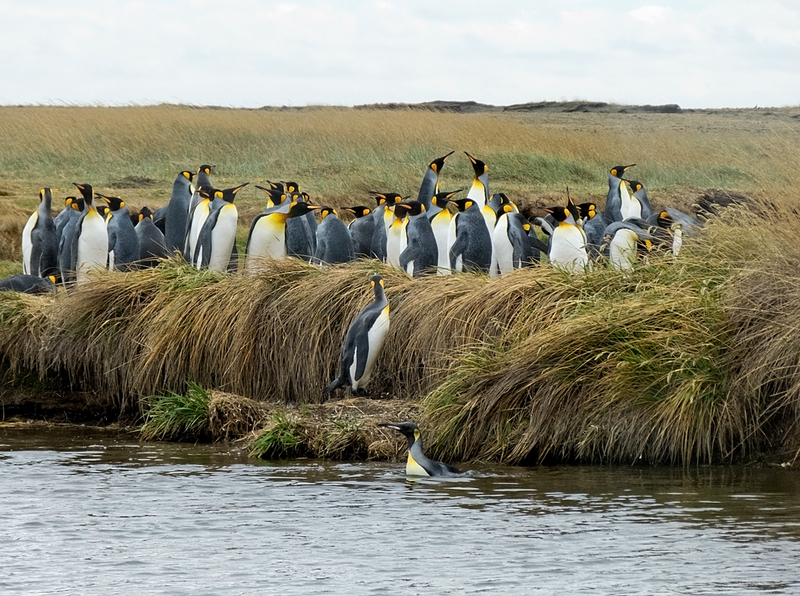 How fantastic you had the chance to see the King penguins, I didn’t realise you could see them in Patagonia either. Definitely going in my travel notebook for next time I go to Argentina/Chile! Some amazing photos! What an adventure! Thanks Bill. 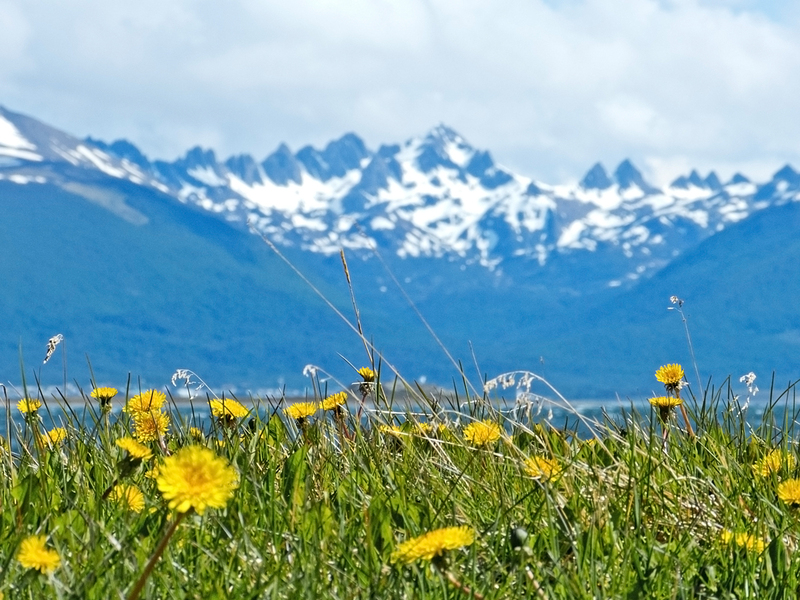 Yes, an amazing adventure – Patagonia was wild and fabulous in every way. We loved it. What can I say? An inspiration to travelers and all who want to travel. If this doesn’t get us off the couch then nothing will. Patagonia is amazingly wonderfully fabulous! Thanks for the memories! We did a very similar route through Patagonia last December. Your mode of travel is far more interesting though, because you go over land. We were on a cruise ship, so our itinerary was much more limited and organized. Still, I can feel the wind of Ushuaia and see the wonderful views. Your penguin photos are the best I’ve seen! Send them to National Geographic. You’re welcome! It’s a fabulous part of the world isn’t it? Did you go to Antarctica? Thanks re the penguin photos – maybe I will just send them off! Thank you! So happy to bring back happy memories for you 🙂 It’s such a special place. I’m so very glad we went there, and can share it a little bit. I will check out National Geographic – I think they have a daily travel photo thingy happening. Wow, thanks for doing all the “legwork” for us to spend an hour with the penguins and gift us with these intimate photos, Alison. Of course, I love the photo of the Fox. Have you noticed how foxes are getting popular lately. I think it because we named our son Fox. haha. Thanks Kozo, and you’re very welcome 🙂 Aren’t those penguins something?! I think Fox is a great name. I was surprised by how unafraid they were – most wild animals run away, but not these foxes, they hung around and were a bit curious. I love your connection between true love and the trees always leaning in one direction. PENGUINS!!!!!!!! Oh man, I love penguins. Great photos as always. Thanks Danny! Yay PENGUINS!!!!!! It was amazing to see so many of them, and to be able to get so close to them. Brilliant little fellas. I’d swap my dogs for one of them any day. Mind you I’d swap them for a jigsaw puzzle with a piece missing. Thanks Curt. The singing was quite unusual and wonderful. Never heard anything like it, and at the time was wondering how how I could describe it on the blog. 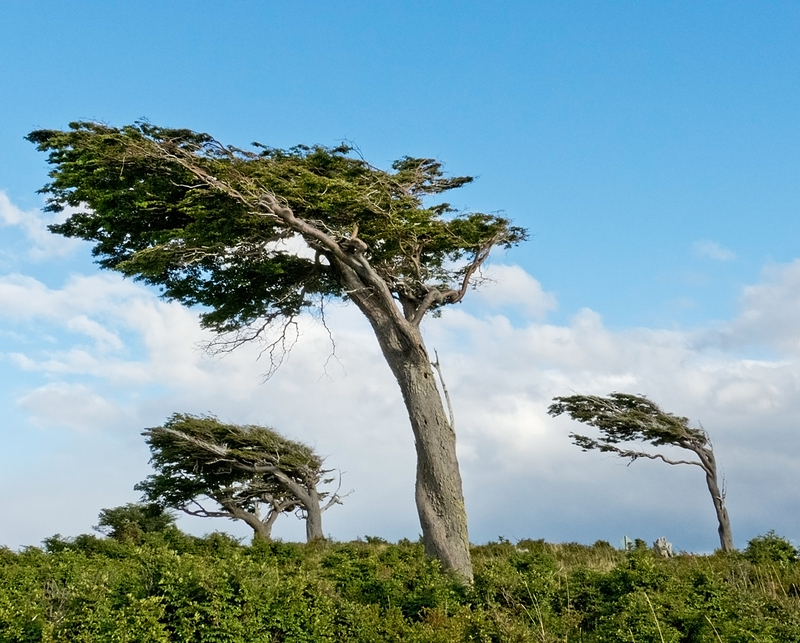 The windswept pictures sure tell a story don’t they?! Thanks Cindy. Happy Holidays to you too. I so loved our trip to the end of the world – It just makes sense that it would be so extreme…hang on! 🙂 Much love to you both! We loved the trip to the end of the world too. I can’t believe I finally got there. Much love to you too. Happy Holidays. What camera and lens(es) do you use? The photos are stunning, and attimes appear to be wide-angle? I’m no expert by any means. Hi Alex, thanks re the photos. Some of it is just dumb luck, and some of it is extraordinary subject matter. My camera is a Panasonic Lumix FZ150 bridge camera with a built in 24x optical Leica lens – so nothing too fancy. I’ve been wanting to upgrade to a full DSLR but the weight always put me off. Now there are those mirror less cameras so I’ll probably be upgrading to a Fuji pretty soon. I’d love both a wide angle, and a zoom lens, but will choose just a zoom, again because of the weight factor. Thanks for the beautiful and wonderful posts about all the penguins you saw! 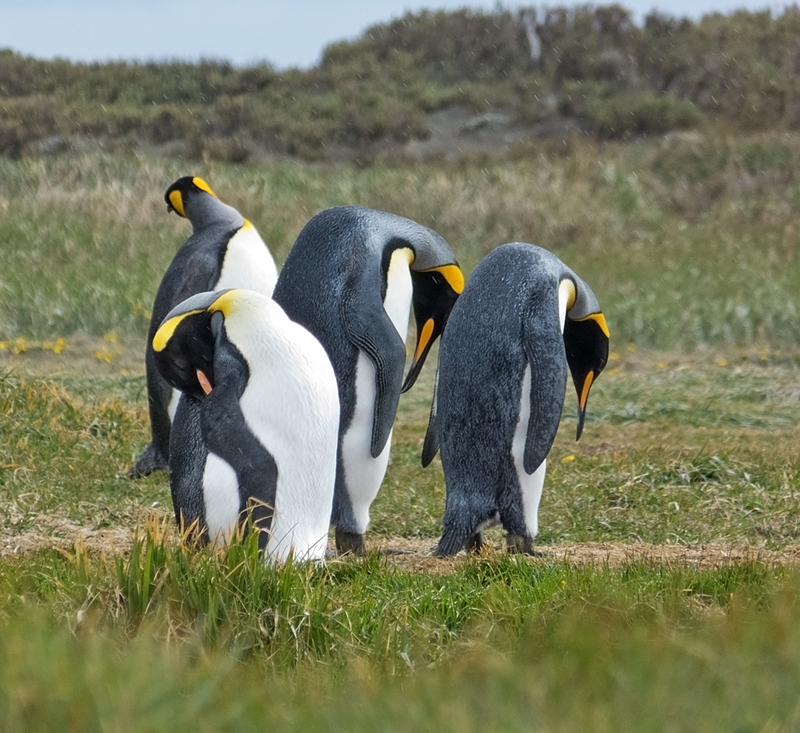 What tour company did you use for the King Penguins? 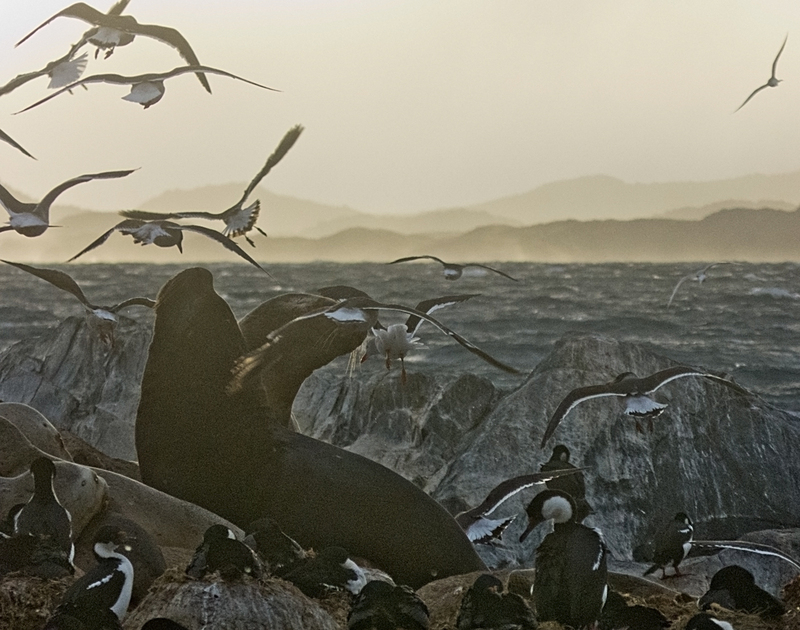 A group of us will be in Punta Arenas in November and would love to go on the tour too! Thank you in advance for your help! Hi Alison! I can’t believe I totally missed your message. Glad I came back to your blog to see if you responded 🙂 Thank you so much for your help! Do you recall approximately how much the tour should cost? And how many of you were there? And was it an English speaking tour? There are only three of us going together. THANK YOU so much for your help again! We travelled in van. I think there was about 10 or 12 of us. It was all English speaking. We can’t remember what we paid as we paid cash, but it was definitely well over $100 each. Thank you for the quick response! I’m still waiting for them to email me back! Did you guys get any information on the flora/fauana and/or education about the penguins? There’s a company that will take us, but they said for $105, it’s literally just going to be a drive to the location and that’s it. That same company said that for $200 per person, we will get a guide…seems a bit overpriced…? $200 sounds like a lot. We weren’t given a whole lot of info about the penguins, just driven there and back as far as I remember, but be aware it’s a very very long drive both ways because of the crazy ferry schedules. For about an hour or so with the penguins it’s a full day of driving – but really really worth it. Thanks for all the info, I really appreciate it! I just booked wtih your company so all set! Woohoo! Yay! Have a great time! Yes – so much world, so little time. The more we travel the more we want to see. So much to see over there! We saw a fox, flamingos, and elephant seals, too. And whales! Thinking about it makes me want to do a similar wildlife trip somewhere, soon! Great photos! Penguinsa are so expressive! Thanks TSMS. It’s an amazing place isn’t it! We loved it. If you want another wildlife excursion I highly recommend the Galapagos – one of the highlights of all our travels. Alison & Don, I so admire your intrepid adventures into the wilds! I’ve totally enjoyed the descriptive and extraordinary details of this post. And thank you for the insights I’ve gained. 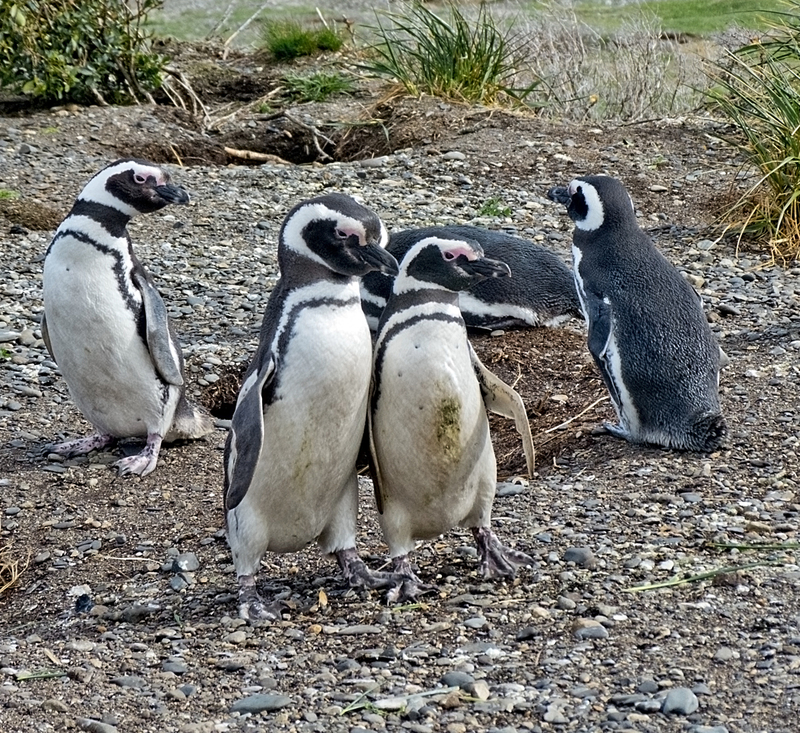 I followed your link for a closer look at the Magellanic penguins and learned more on the Kings and gentoo. So beautifully adapted tothat wild unpredictable environment. Amazingly rich marine environment. Thanks so much Liz. 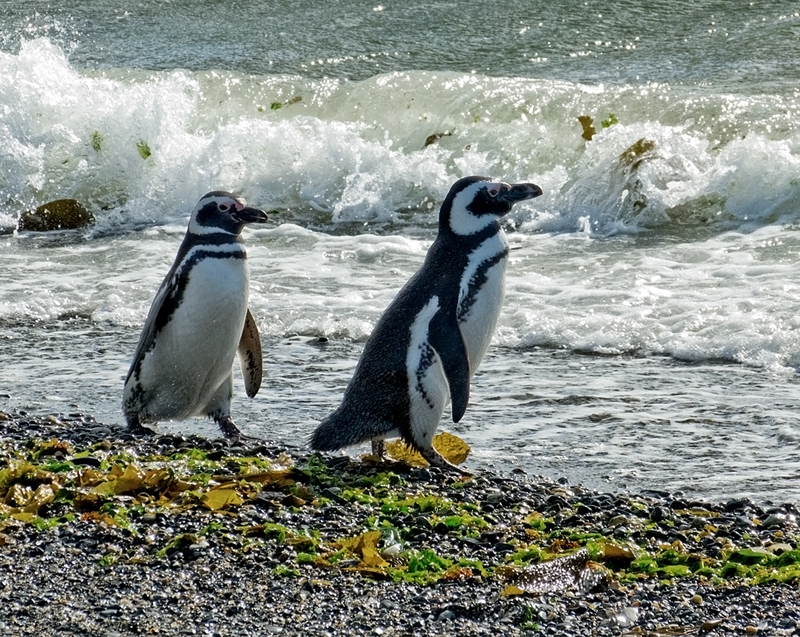 We had an spectacular time in Patagonia and when I saw your African penguins I was immediately struck by how like the Magellanic penguins they are. Must be at least first cousins! 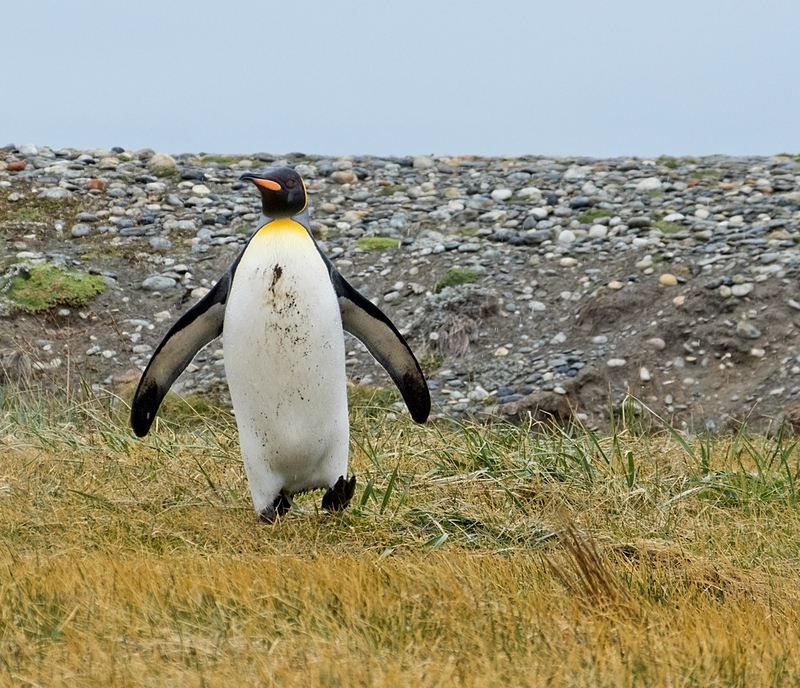 And the Gentoos with their pebble nests – I’m constantly amazed by nature and all it’s variety. I can’t wait to get back to Africa! I did a four month overland trip from Johannesburg to London way back in 1980 and the experience still sings strongly in my heart. And Don has never been so it’s pretty high on out list.